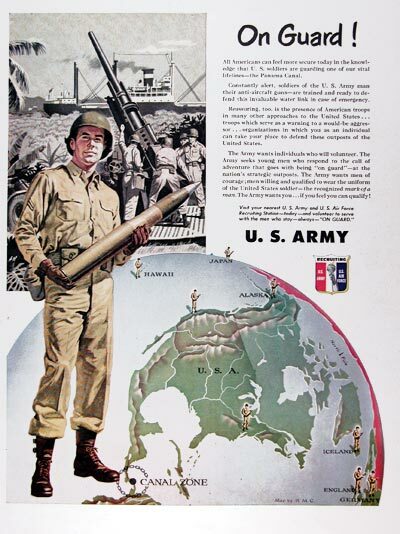 1951 U.S. Army & Air Force Recruitment original vintage advertisement. On Guard! All Americans can feel more secure today in the knowledge that U.S. soldiers are guarding one of our vital lifelines - the Panama Canal. Constantly alert, soldiers of the U.S. Army man their anti-aircraft guns, are trained and ready to defend this invaluable link in case of emergency. The Army wants individuals who will volunteer. The Army wants you, if you feel you can qualify!